Pesto is one of those dead easy, whiz it up and away you go kind of meals. The only thing that stops me is pine nuts. Yes, I love them, they are delicious. However I can’t source any local ones and they are really quite expensive. Swapping the pine nuts to a cheaper and more local nut works just as well though. I’ve made it with pecans, walnuts before and for this one it was almonds. Blitzing whole almonds in a blender (skins on) then adding 2 bunches of fresh basil, some grated parmesan and some great local olive oil. It’s an accompaniment to lots of dishes. It never lasts long in this house, but this amount will give a good sized jar, which I just top up with some extra olive oil, and then keep it in the fridge. Eat it stirred through pasta, a little chopped up chilli and extra parmesan. Mixed with rice, baby spinach, and crumbled fetta. Or simply on some toasted sourdough, bruschetta style. This entry was posted in Food Glorious Food, Making, Creating + Frugal Living and tagged almonds, basil, Making, Creating + Frugal Living, olive oil, pesto, recipes, seasonal, simple, slow food, sydney, the little general by cityhippyfarmgirl. Bookmark the permalink. I must be a bit of a heathen, as I can’t taste a whole heap of difference between the two in pesto. Saying that I adore almonds in anything, so maybe I just love it because of that. I hope your basil grows in abundance in the warmer weather Celia! Yes to pesto, I also use almonds or variations such as cashews and substituting with different herbs and greens as I go. Sometimes sundried tomatoes get thrown in, sometimes chilli, often a few anchovies. In any case, makes most of the store-bought stuff seem redundnant and frightfully expensive to boot. Yay to Friday! I love pesto so much. I’ve made walnut pesto before, but haven’t tried any other nuts. I will have to do this next time I bake bread – pesto on fresh sourdough with avocado & tomato, maybe with ham or a poached egg would be an amazing lunch. Or breakfast. Or dinner. Now I’m getting hungry! Yum Betsy. 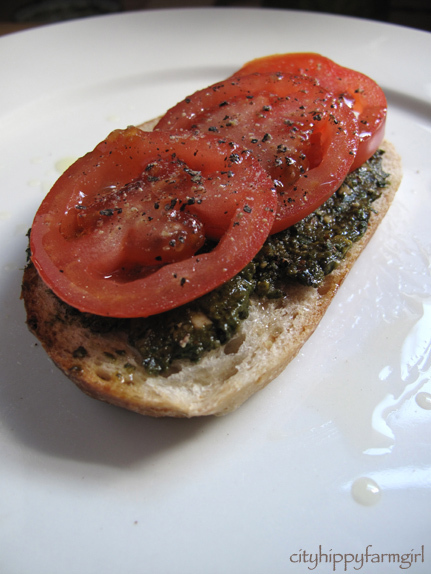 Sourdough and pesto is the best. That’s what I’ll be having for breakfast tomorrow 🙂 I baked wholemeal rolls this morning, and I’ve just made pesto to go with dinner (pasta, with fresh tomatoes). I need either a better food processor or more patience if I want pesto as smooth as yours, though! Pesto with macadamias is really good. Up here in northern NSW, macas in season in shell from the Farmers Market are really cheap. And easy to grow too. I have a couple of older trees and lots of young ones just starting to bear. Linda if I lived up your way I would be popping macadamias in everything. They are never particularly cheap down here. I remember a macadamia/caramel icecream in Lismore once. Ahhh…. I agree pesto is also very flexible to accompany steaks and seafood too. I love roasting pine nuts and just eating spoonfuls as a snack 🙂 They are wonderfully delicious but I wonder if the fat content is as high as peanuts though. I’m a nut, never use nuts. But I like the idea of the almonds! What’s a common nut in your corner of the world Tandy? My hubby will go nuts over this – super easy and so tasty. You too Mandy, happy eating. I love pesto. Almonds sound like a great idea. Pinenuts are expensive even in Italy, so other nuts make a good substitute. Make my mouth water!!! I love pesto. I love pesto in any of its incantations. 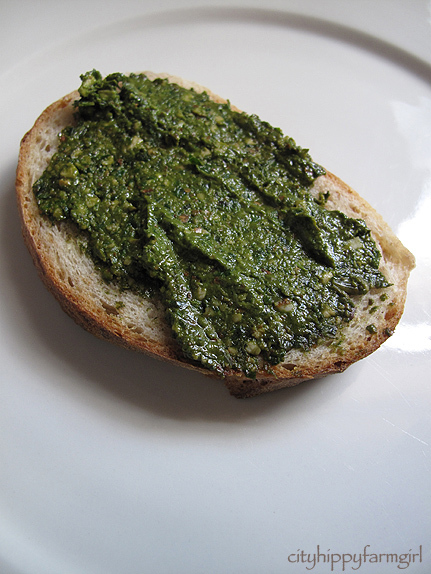 Mint pesto with sesame seeds. Basil and macadamia sounds good too. I use almonds in almost anything I use nuts in. And you’re right- pine nuts are unreasonably expensive. What’s the deal with them? What a coincidence, today I made pesto too! I used walnuts this time and it came out great. I usually portion it out into plastic lined muffin tins and then freeze it. When thawed, each block makes enough sauce for a few homemade pizzas or a pound of yummy pasta. Bon apetit! Hmm, never had pesto. I ought to try making my own with cashews, that way I’ll know I can eat it. Good reminder! Yours looks really tasty smeared on bread with tomatoes, mmm! Carrot top pesto was a new one on me this summer, it does work, but it’s quite coarse compared to say making one with basil like you, or with rocket which is my favourite. I get further and further away from tradtional pesto these days and often use yoghurt instead of oil and all sorts of nuts, I like it with hazelnuts and with almonds and cashews are good too. I’m not so keen on pine nuts as they go rancid very quickly being so high in oil. Do you put garlic in yours? Carrot top pesto eh? I’ll have to consider that one for next time. I’ve never changed nuts..must try this (my, that sounds dangerous). Yummity yum. I love pesto and have made various kinds over the years, but I don’t do it very often because I hate washing up the food processor – it’s so damn awkward!